We have been following the worsening pollution crisis in China, but a new report shows how the Chinese government’s rejection of basic environmental protections is degrading the environment of the world. Western states, particularly California, are finding their air quality reduced dramatically by Chinese pollution. A recent study documents adds an interesting twist: calculating the percentage of Chinese pollution tied to exports to the United States. It suggests that we are outsourcing industrial productions and getting the resulting pollution from the Western side of the country. A new study in the journal Proceedings of the National Academy of Sciences found Chinese pollution related to exports contribute up to 12% to 24% of daily sulfate concentrations in Western states. Sulfate concentrations, ozone and carbon monoxide are all up and attributed to the Chinese exportation of pollution with its cheaper products. The greatest concern is black carbon which is linked to asthma as well as diseases such as cancer, emphysema, and heart and lung disease. Some 21% of export-related emissions from China in these targeted areas came from exports to the United States. China’s massive increase in coal-burning power plants is a great contributor. The beneficiary of the shift is the Eastern states, but those cheap Chinese goods from China are arriving in a cloud of industrial pollution for the United States. wait, so what gets pumped into the atmosphere on one side of the globe can effect conditions on the other side. We just need to build large air scrubbers and place them in strategic locations in the western states. Those areas with wind patterns which bring the pollution from China. Building them will create jobs and the particulate probably has industrial applications. The added benefit will be to clean pollen from the air. A family member is one of those American designers of goods and also make in China. They own two big gorgeous homes in pristine areas of Wisconsin. I wonder how long it will take for them to worry about the air their children breath when out playing or swimming in one of the gorgeous lakes they live next to? I recall they removed some toys that were made in China that had been tainted with toxic metal from their children’s toy box a while back. They also don’t give their dog any of those jerky treats from China. This is a perfect example of why capitalism is pure evil. Growing up on Vancouver Island, on the West Coast, in the 60’s, we constantly heard about the pollution coming from Los Angeles and the rest of California. It went East to the Grand Canyon and West to China. Amounts, not of the scale as today, but substantial were being deposited in China where, at that time, there was little if any air pollution. In the 60’s the US was #1 and immune from the opinions of the rest of the world. Sound familiar? Regarding the export of coal to exacerbate the situation, special interest groups that create enormous wealth in this country run the government. There may be an upswell of complaints and posturing but in the end because of the hundreds of millions of dollars the politicians take to run their campaigns, money necessary to respond to the opposition which is also paid for by the special interest groups, the coal gets mined and the special interest groups continue on with the oligarchy we mistake for a democracy. Sometimes it goes to lengths that are simply criminal. In the 70’s in British Columbia the lumber mills were closing down because the housing market was in a slump. Some clever entrepreneurs, you know those that made this and the other country great, ‘clear cut’ the forests, loaded the logs onto barges and towed them to Japan. Fast money for the special interest groups meant lay offs at the mills. Some of the mills were dismantled and taken to Japan. So, what’s the problem here? We live in a country run by special interest groups, an oligarchy. We may be #1 but we are not a democracy. When politicians are easily purchased by the moneyed, then manufacturing jobs, environmental protection and health considerations are deemed unnecessary to the pursuit of profits at all costs. Not profits that benefit the majority, but profits that benefit the small minority who have access to the levers of power. Look at the WVA water contamination issue. The company simply goes belly-up due to the extent of the contamination and off they go without a care in the world, leaving the cleanup to the taxpayers. Rinse and repeat. .
And while Chinese pollution has reached western US shores, the main stream corporate media seems lacking on the Fukushima radiation contamination that has invaded the western US. Contamination from both Japan and China travel on the same air and water currents….. But then again, profit is more important than people. On a globe, what goes around comes around. If only the jobs hadn’t moved overseas to benefit a few pockets and stayed here in America, IF only. 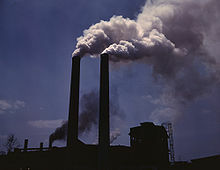 Tight regulations would have kept pollution manageable, albeit more expensive for the manufacturer. This is where I look at Wallmart and other outfits that sell cheep stuff at low, low prices. With the drought, Chinese air pollution, Fukushima radiation, the hot air coming out of Sacramento, and being overdue for a big earthquake, I think it’s time to move. People (none of us dogs) argue that the future of Microsoft and Google and these techno giants is “in the clouds”. They want you to believe that the metadata is up there in the air in clouds and that perhaps it is ok for NSA and the CIA to retrieve your emails from some cloud. The truth of the matter is that the clouds have no angels, no metadata and are polluted with all that tea from China. Sending manufacturing jobs to China so that the Koch Brothers can cash in on cheap labor is backfiring on the rest of us. 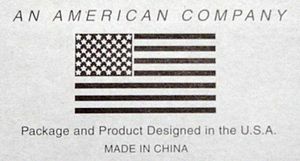 Buy American made products when you can. Echoes of Ross perot and the giant sucking sound… this time turns out to be the jet stream blowing over pollution from the crap we outsource. This is a political issue here in Washington. There are plans to build a large coal exporting rail hub with linkup to to waterfronts and a few sites are being considered. There is a growing movement to prevent the construction of these terminals for the very reason Professor Turley is writing about. There is a considerable amount of money to be made in this and it is the largest driving force. Politicians like it because, they claim, it brings jobs into the area. This is true but the real reason is lobbying efforts by some industries. I don’t know if the anti-coal folks will prevail. Most of the legislature in this state is in the pockets of large corporations. With the coal industry on the East Coast having trouble lately there is going to be quite a push to get these terminals constructed. Correct me if I am wrong but wasn’t China exempted from the Kyoto protocol? I felt that was a terrible mistake in that it gave China free reign to pollute the world. I wonder if the US gov’t can put the coal export conditional on cleaning up their act. But this would probably be fought by Congress. It is funny how China can suddenly put a ban on Geoduck imports due to pollution levels reported in the clams and the US doesn’t object and when China poisons and polutes the US, out gov’t does nothing about it. So what is with the powers to be who claim to be such champions of the environment to garner votes something like this terrible pollution is ignored?